Hello i changed the Transport system to allow Transporters in Instances and Stop them. there are still some problems with the creatures... on some transporters they are working fine and on others they get pushed off the transporter when interacting with them. i will upload a patch if it maybe someone else nows how to fix the creature problem. transport creatures needs the missing spawn flags to work correctly (we should add these flags to table transport_creatures like event_creature_spawns?). first problem is that the transporters are working but the calculation of move to next waypoint is wrong or something like that that means the transporer is desyncronized and we get teleporter at a wrong point and the transporter is messed up . transporters in instances are working. maybe evafairy or dankodj knows a way to fix it. feel free to use this i would like to see it fully fixed. when i find a soloution to fix it i will update the patch. The post was edited 1 time, last by aaron02 ( Oct 15th 2015, 12:02pm ). 2. If you try to talk to some npcs they run away to another position. 3. Why do you use a new table? 4. sota should be updated too, I commented two lines to investigate your problem. The post was edited 1 time, last by DankoDJ ( Oct 15th 2015, 5:35pm ). i will look at it i.
on sota its not used its okay the transporters there are like elevators they need to be added. ist nothing with the transport handler. after compiling on debug mode and startup in debug i got no crash. The post was edited 4 times, last by aaron02 ( Oct 15th 2015, 9:36pm ). 3. What should happen to the old table? It is useless now. Travel from Durotar -> Warsong Hold, leave the transporter and wait... the transporter travels back to Durotar. If it's traveling back to Warsong Hold server crashes. uptime 5 houers with my new pull request. tried to reproduce your crash not happening. The double spawn is not the problem... The server is crashing trying to port the npc-passenger on changing the map, they falling through the map. (5min 20sec). ​Travel from Durotar -> Warsong Hold, leave the transporter and wait... the transporter travels back to Durotar. If it's traveling back to Warsong Hold server crashes. So this is valid for intercontinental transporters. 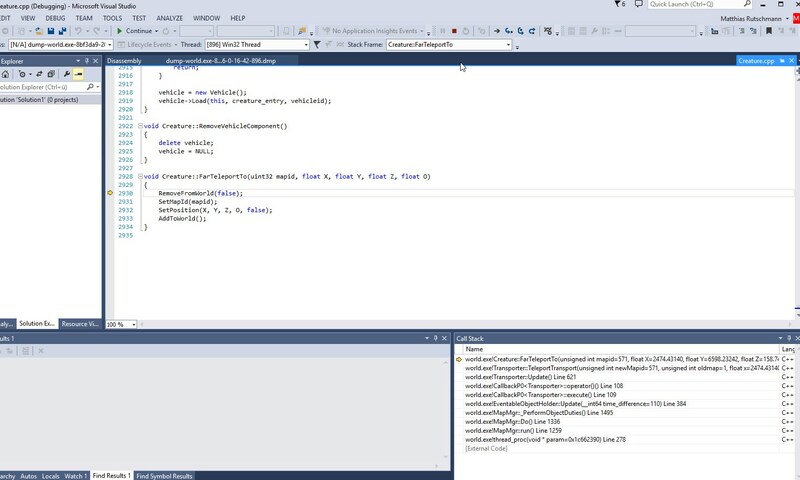 Using lates feature/transporter (includ your PR) Debug Win32 with all modules. i reproduced this and i get thos errors too. Finally we have fixed the issues. We need feedback! Test the transporters and if you think everything looks good or there are NEW issues, give us the feedback. Awesome - I tested it during the last two days (open world transports). No crashes, creatures didn't disappear anymore. Thanks to all authors, great work!